"I speak about the mindsets of these characters," composer Kaija Saariaho says. "What does it mean that we love somebody? And do we really love another person, or do we love our idea of love?" 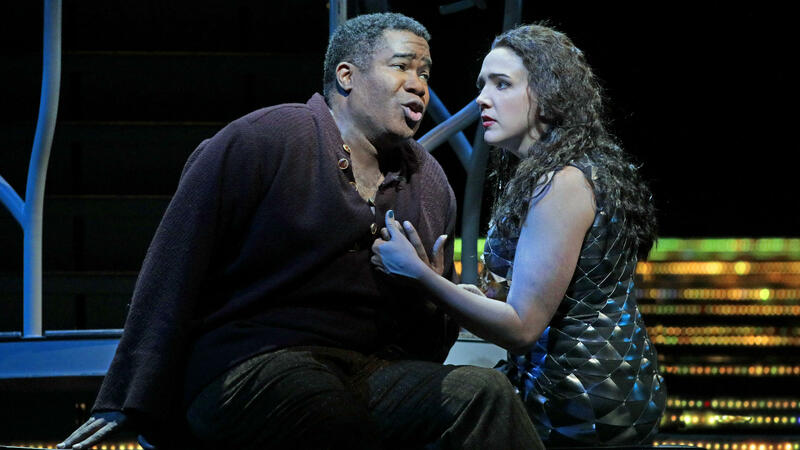 Eric Owens sings the part of Jaufré Rudel, the ballad-writing prince, in Kaija Saariaho's L'Amour de Loin. Susanna Phillips, who plays the countess Clémence, describes L'Amour de Loin as a classic. "The more you experience it, the better it gets," she says. The last time New York's Metropolitan Opera presented a work written by a woman was 113 years ago. It's a drought that lasted longer than the years between the Cubs' World Series victories. That situation has finally been rectified this week with the New York premiere of the opera L'Amour de Loin by Finnish composer Kaija Saariaho. For her part, Saariaho is a little tired of talking about the operatic glass ceiling. "It's kind of ridiculous," she says. "I feel that we should speak about my music and not of me being a woman." Another Finn, Susanna Mälkki — herself only the fourth woman ever to lead the Metropolitan Opera orchestra — is conducting Saariaho's opera. She says Saariaho's compositions have a special voice. "Her language is unlike any other music language of any other composer," Mälkki says. "I don't actually know how she does it, because we are really swept on to a mysterious world of the sounds." L'Amour de Loin, or "Love from Afar," and its composer have both been around for a while. Saariaho has had her work performed in concert halls for decades, and L'Amour de Loin is her first of several operas. It premiered in Salzburg, Austria, in 2000 and has received 10 different productions on three continents since. Saariaho admits it explores well-trod operatic territory — love and death — but says there are different ways to approach those themes. "I speak about the mindsets of these characters," she says. "What does it mean that we love somebody? And do we really love another person, or do we love our idea of love? And, then, about death: What happens to us when we lose somebody we love?" The opera is based on a real life 12th-century French prince and troubadour who is said to have fallen in love with a countess from what's now known as Lebanon. He'd never met her, only heard about from travelers, but he wrote ballads in her praise, some of which survive to this day. Mälkki says Saariaho's music manages to combine the sounds of the troubadour with those of this romanticized woman a world away from him. "It's a very intimate piece," she says. Then, a traveler — a pilgrim in the opera — informs the troubadour prince that he's told the countess of his love. Eric Owens, who sings the part of the prince, says the news upsets his character. "He thinks to himself, 'Well, it's going to be more difficult for me to compose these songs knowing that she's somewhere worrying about this,'" Owens says. So, he decides to travel to meet her. In the Met production, she's played by Susanna Phillips, who has a long history with this opera. Dawn Upshaw starred in the opera's premiere, and Phillips went to watch her while she was a college student doing a summer program in Salzburg. She says she even babysat Upshaw's children while their mother rehearsed for the show. Phillips can't help but express shock that it took the Metropolitan Opera 113 years to produce another work by a woman — because, she says, this one feels like a classic. "It's rare that you come across a piece written so recently that feels like it should be part of the canon," she says. "The more you listen to it, the more you experience it, the better it gets." Saariaho says she's dreamed about having her work performed at the Met and is happy her opera is finally on its stage. But she's also acutely aware of the problems women still face in classical music. "I've seen it with young women who are battling with the same things I was battling ... 35 years ago," she says. Saariaho says the persistence of these gender barriers might even cause her to revise her earlier point. "Maybe we, then, should speak about it, even if it seems so unbelievable," she says. "You know, half of humanity has something to say, also." In addition to the stage premiere, audiences in movie theaters around the world will get a chance to hear what Saariaho has to say next Saturday, when L'Amour de Loin will be broadcast in high definition on screens across the country. It's a drought that lasted longer than the Cubs. Last time New York's Metropolitan Opera presented a work written by a woman was 113 years ago. That situation was corrected this week with the New York premiere of an opera by a Finnish composer that many think is a contemporary classic. Jeff Lunden has more. JEFF LUNDEN, BYLINE: Composer Kaija Saariaho is a little tired of talking about the woman thing. KAIJA SAARIAHO: It's kind of ridiculous. I mean, I hope there are some other reasons for doing it. LUNDEN: Like maybe her music? SAARIAHO: That has always been my attitude - that I feel that we should speak about my music and not of me being a woman. LUNDEN: Another Finn, Susanna Malkki, herself only the fourth woman ever to lead the Metropolitan Opera Orchestra, is conducting Saariaho's opera. SUSANNA MALKKI: Her language is unlike any other music language of any other composer. And, you know, I don't actually know how she does it because we are really swept on to a mysterious world of the sounds. LUNDEN: "L'amour De Loin," or "Love From Afar," and its composer have actually been around for a while. Kaija Saariaho has had her work performed in concert halls for decades. "L'amour De Loin" is her first of several operas. It premiered in Salzburg, Austria in 2000 and has received 10 different productions on three continents since. The composer admits it explores well-trod operatic territory, love and death. SAARIAHO: And yet I was thinking that I speak about them differently, that I speak about the mindsets of these characters. And what does it mean that we love somebody? And do we really love another person, or do we love our idea of love? And then what happens to us when we lose somebody we love? ERIC OWENS: (As Jaufre, singing in foreign language). LUNDEN: The opera is based on a real-life 12th century French prince and troubadour, who it said fell in love with a countess from what's now known as Lebanon he'd only heard about from travelers. He wrote ballads in her praise, some of which survive to this day. Conductor Susanna Malkki says Saariaho's music manages to combine the sounds of the troubadour with those of a romanticized woman from a culture a world apart. MALKKI: It's a very intimate piece. I mean, not only are we talking about the innermost secret feelings of the characters. And it's a dialogue inside themselves. And then the orchestra is commenting on that, almost like in Wagner pieces. The orchestra already knows, but the characters don't know yet. SUSANNA PHILLIPS: (As Clemence, singing in foreign language). LUNDEN: Then a traveler, a pilgrim in the opera, informs the troubadour prince that he's told the countess of his love. Eric Owens sings the prince. OWENS: When the pilgrim tells him that he's gone and told this woman about him and about his love for this ideal beauty, it shocks him. And then he gets upset because he thinks to himself - it's like, well, it's going to be more difficult for me to compose these songs, knowing that she's somewhere, knowing about this. OWENS: (As Jaufre, singing in foreign language). LUNDEN: He decides to travel to meet her. In the Met production, she's played by Susanna Phillips, who has a long history with this opera, which initially starred Dawn Upshaw. PHILLIPS: I was at the premiere in Salzburg. I was in college. And I was studying in a summer program there. And I babysat her children while she was rehearsing for this. 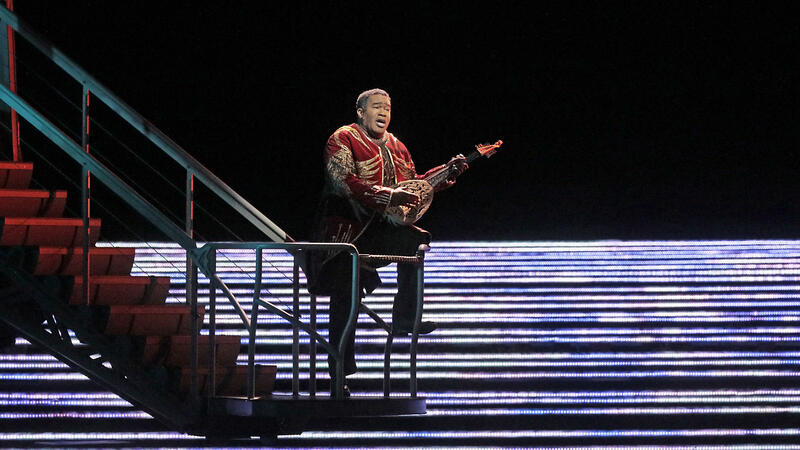 LUNDEN: Phillips can't help but express shock that it took the Metropolitan Opera 113 years to produce another work by a woman because, she says, this one feels like a classic. PHILLIPS: (As Clemence, singing in foreign language). It's rare that you come across a piece written so recently that feels like it should be part of the canon of repertoire done everywhere. It is an incredible piece - that the more you listen to it, the more you experience it, the better it gets, the deeper it gets. 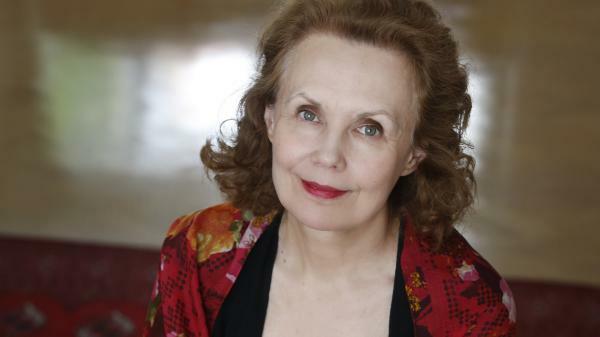 LUNDEN: Composer Kaija Saariaho says she's dreamed about having her work performed at the Met and is happy her opera is finally on its stage. But she's also acutely aware of the problems women still face in classical music. SAARIAHO: I've seen it with young women who are battling with the same things I was battling, like, 35 years ago. So I think, maybe, we should speak about it, even if it seems so unbelievable. You know, half of the humanity has something to say. LUNDEN: Audiences in movie theaters around the world will get a chance to hear what she has to say next Saturday, when "L'amour De Loin" will be broadcast in high definition. For NPR News, I'm Jeff Lunden in New York. PHILLIPS: (As Clemence, singing in foreign language). Transcript provided by NPR, Copyright NPR.